He worked on the 1959/1960 television show Startime with Connie Francis, and sang for Louis Jordan. At age 17, he formed a trio with his siblings Salome Bey and Geraldine Bey (de Haas) called Andy and the Bey Sisters. The trio went on a 16-month tour of Europe. The Chet Baker documentary Let's Get Lost includes footage of Bey and his sisters delighting a Parisian audience. The trio recorded three albums (one for RCA Victor in 1961 and two for Prestige in 1964 and 1965) before breaking up in 1967. Bey also worked with Horace Silver and Gary Bartz. 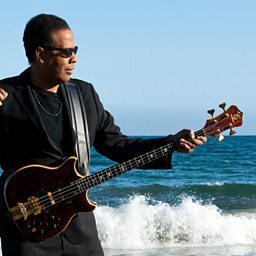 In 1974, Bey and Dee Dee Bridgewater were the featured vocalists on Stanley Clarke's album Children of Forever. Later, Bey recorded the album Experience and Judgment, which was influenced by Indian music. He then returned to hard bop, and recorded covers of music by non-jazz musicians, such as Nick Drake.